Her Majesty Queen Elizabeth II has a special flag that is flown only on those occasions when she is visiting Australia. The flag was approved by Her Majesty on 20 September 1962 and first used during the 1963 royal visit. The flag consists of the Commonwealth Coat of Arms with a large gold seven-pointed Federation Star overlapping it in the centre. Within the Federation Star is Her Majesty's initial 'E' in gold, and above it rests a stylised St Edward crown, enclosed by a garland (a 'chaplet') of gold roses and set on a blue roundel. Her Majesty's personal flag for Australia is used in the same way as the Royal Standard in the United Kingdom. The flag is to be broken in HMA Ships, or on official buildings or in enclosures only on occasions when Her Majesty the Queen is actually present. The exception to this rule is parades on shore in honour of the Sovereign's birthday, when the flag, if available, is to be flown even if Her Majesty is not present. When it is flown on or outside a building, no other flag should be flown with it. When the sovereign embarks in one of HMA Ships or boats the distinguishing flag or pennant of any Flag Officer or Commodore which may be flying in that vessel is to be shifted to another. In a private ship the masthead pennant is always displaced when the standard is broken. 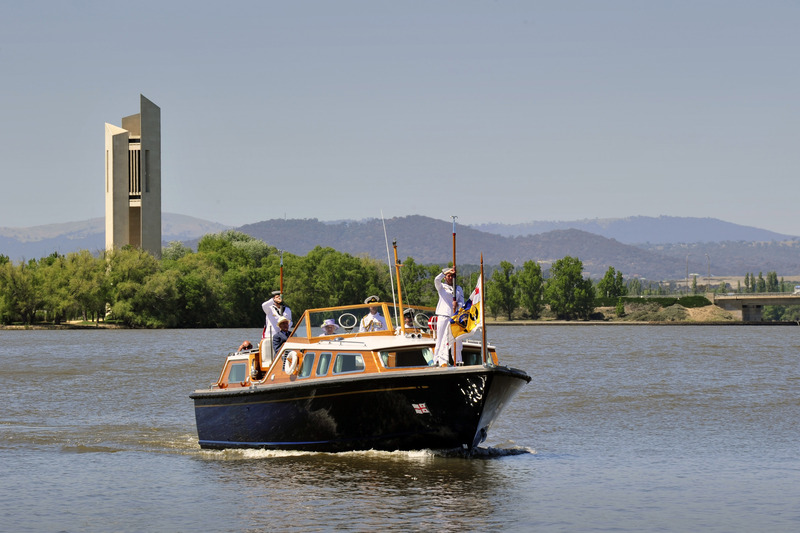 Her Majesty Queen Elizabeth II is ferried across Lake Burley Griffin in Canberra during the 2011 Royal Visit. 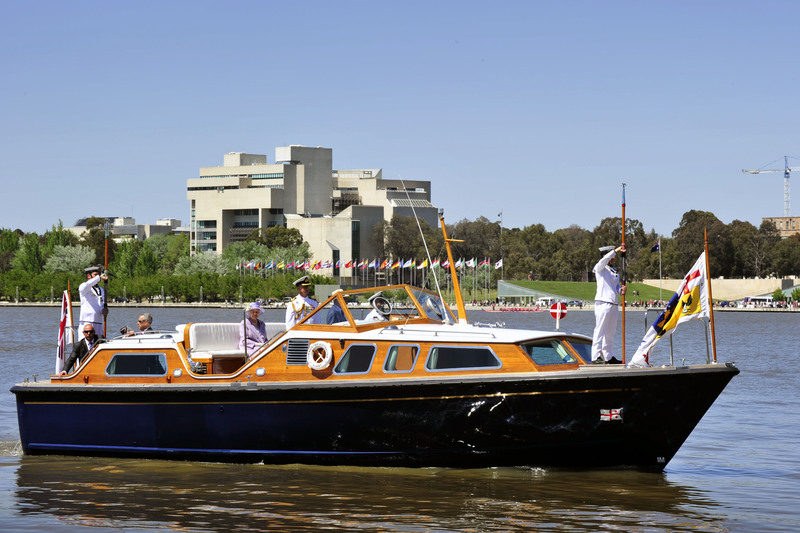 Note the presence of her personal flag flying in the bows of the royal barge.